According to an article on PR Daily, less than 2 percent of people have had any formal education on listening effectively. No wonder so many people don’t know how to listen in the world! Many times when we talk to people, it seems our words simply go in one ear and out the other, which makes communication with them difficult, if not impossible. We could speculate for days on the reasons why people don’t listen; maybe they have a lot on their mind and can’t seem to quiet it enough to listen to you, or maybe they just don’t have any interest in the topic at hand, or maybe they love to hear their own voice more than other peoples’. We can’t get inside their heads and make them listen, but we can control our methods of dealing with these people, so that communicating with them doesn’t feel like talking to a rock or some other inanimate object. 1. Ask them more questions. Anytime you try to explain something in detail, and don’t give the other person a chance to follow up with questions, the conversation will start to become one-sided. After each main point you make, open the floor to allow them chances to ask any questions they might have. You could even ask them questions to reiterate your points, such as “What have you learned so far?” or “Do you have any questions about what I’ve said?” People like to feel involved in the conversation, not like they’re sitting through a lecture in college. Obviously, it takes two people to have a conversation, so make it more fun and interactive, especially if you’re trying to teach someone a new skill. 2. Give them a chance to talk. Maybe they don’t have any questions for you, but they just want to make their points heard. 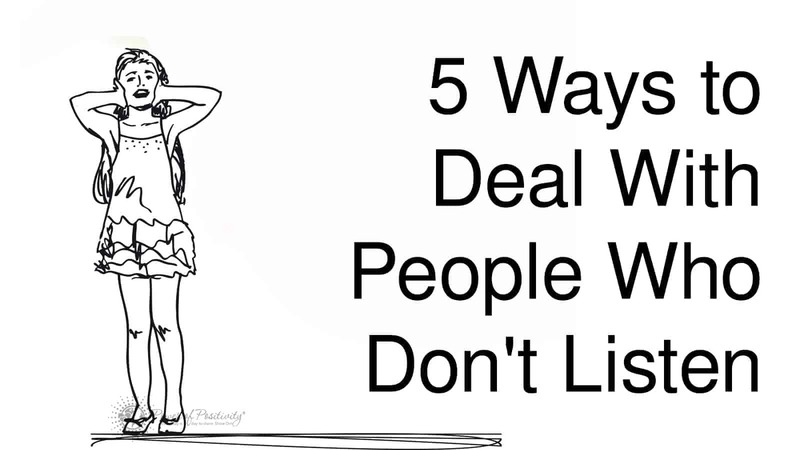 Instead of focusing on getting them to listen, maybe try listening to them. Show patience with them, and make sure you give them opportunities to speak their mind. You never know; maybe people talk over them a lot, so they feel like their voice doesn’t matter. Give them the opportunity to express themselves, and once you’ve earned their trust, they will care more about your thoughts and ideas. 3. Focus on creating a meaningful relationship with them. You can’t have effective communication with someone if you don’t take the time to build a relationship with them. If you don’t know who they are or what they’re about, how can you possibly know how to get ideas through to them? Instead of fixating on their flaws in communicating, you need to earn their trust and create a safe space for them to express themselves. The best communicators don’t try to push ideas on others; they simply try to create lasting connections with people. Attempt to understand people and show them compassion, and you will find that people will listen to you more willingly. 4. Try to explain things in a way that he/she can understand. To get people to listen to you, you need to get on their level and communicate in a way that makes sense to them. At the end of the day, they need to work on their listening skills, but you could help them along the way. Maybe they just communicate differently than most people, or get easily overwhelmed in conversations. Ask them questions about how you could make communication with you work better for them; if you show you genuinely care about the person, they will feel much more comfortable talking to you, and that respect will go a long way in getting them to listen. 5. Educate yourself more on their learning style. Are they a more verbal or visual learner? Get to know more about how they learn best, so you can communicate your ideas in a sustainable manner. Nothing feels more frustrating than talking to someone who doesn’t seem to comprehend what you’re saying, so to prevent that, try to cater to other people’s learning styles. This might apply more in the workplace as opposed to just talking casually with friends, but no matter the situation, learning all you can about how someone absorbs new ideas can really break the barriers in communicating with them.